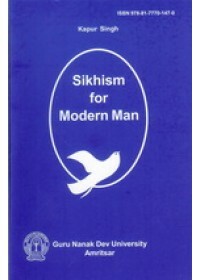 Sikhism For the Modern Man discusses the predicament in which modem man finds himself placed. Numerous dis­coveries of far-reaching consequence, made in the fields of Natural Sciences and accumulation of vast amount of scien­tific knowledge during the last couple of centuries, had shaken man's faith in religious dogma. This is particularly so in respect of the genesis of the universe, its expanse and nature, which man had been taught to believe and marvel at. Various faiths have had their own fanciful notions on this account. Disturbed in his faith by new discoveries and prompted by material advancement in Science, the modern man sought to build for himself a kingdom of heaven on earth. This gave rise to different types of political systems each aiming at Utopia. But these advances too soon shattered his dreams and added to his frustrations. The author sees a retreat to religion as an inevitable consequence. 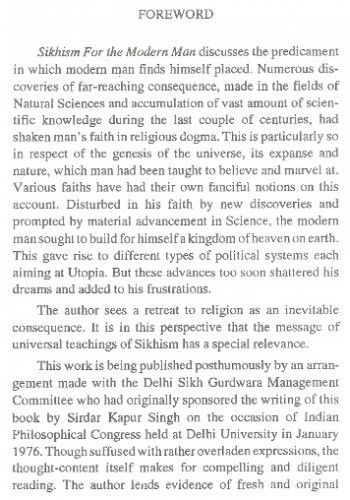 It is in this perspective that the message of universal teachings of Sikhism has a special relevance. This work is being published posthumously by an arran­gement made with the Delhi Sikh Gurdwara Management Committee who had originally sponsored the writing of this book by Sirdar Kapur Singh on the occasion of Indian Philosophical Congress held at Delhi University in January 1976. Though suffused with rather overladen expressions, the thought-content itself makes for compelling and diligent reading. The author lends evidence of fresh and original thinking. On many a subject touched upon by him, he stimu­lates further thought and research. I would also love to place on record my keen appreciation of the ready and valued co- operation the University has received from Prof. Kapur Singh's distinguished son, Dr. Inderjit Singh, Principal Economist, I. B. R.D. 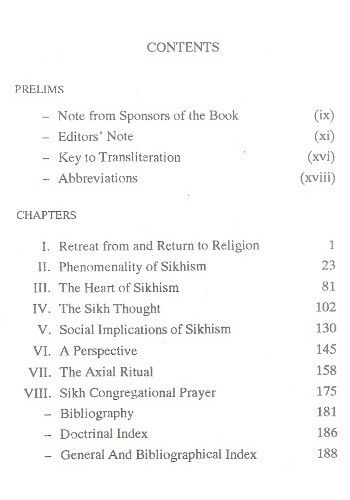 Washington, D.C., U.S.A.
Introduction To Book 'The Sikh Ideology' Book By Daljeet Singh This volume gives a..
Table Of Contents For 'Some Insights into Sikhism' Book By Madanjit Kaur and Piar Singh ..
Introduction To 'The Concept Of Man In Sikhism' By Lajwant Lahori 'Wonders are many but none ..
From The Frontcover Of 'Indian Religious Thought and Sikhism' By Bhagat Singh Hira What Mr. H..